MOUNTAIN VIEW, CA--(Dec 4, 2012) - Today eHealth, Inc. ( NASDAQ : EHTH ), parent company of entities that operate PlanPrescriber.com and eHealthMedicare.com, published answers to the five questions most commonly asked by Medicare beneficiaries during Medicare's Annual Enrollment Period (AEP), which began on October 15, 2012 and runs through December 7, 2012. eHealth compiled the list of questions using a combination of survey data and interviews with individual licensed agents in eHealth's customer care centers. eHealthMedicare and PlanPrescriber provide educational and comparison shopping tools for Medicare insurance products that allow customers to compare Medicare products side-by-side, connect with knowledgeable, licensed agents, and enroll in select products online or over the phone. Every day people call eHealth's customer care centers asking important questions about their existing coverage and the impact of any potential changes they might make during Medicare's Annual Enrollment Period. In most cases, people on Medicare Advantage plans (MAPDs) or stand-alone Medicare Prescription Drug plans (PDPs) can only make changes to their coverage during the AEP. 1. Question: Are Medicare Advantage plans going away because of health care reform? Answer: No. The government will still spend money on Medicare, and the amount of money it spends on Medicare will still increase each year. However, the rate at which that spending increases will not be as fast. Payments to Medicare Advantage plans were restructured so that more is paid for quality and performance as opposed to paying a flat fee for each specific service performed. Plans are now paid based on their quality and performance (Star Ratings) and are phased-in over time. Plans that get higher ratings receive bonus payments. Plus, Medicare Advantage plans must send rebates to the government if they spend less than 85% of the premiums they receive on enrollee care, beginning in 2014. 2. Question: Is AEP my only chance to change my coverage for the rest of the year? Answer: In most cases, people on Medicare Advantage plans (MAPDs) or stand-alone Medicare Prescription Drug plans (PDPs) can only make changes to their coverage during AEP. However, if a beneficiary is eligible for a Special Enrollment Period outside the AEP time period, they may also have an opportunity to make an election at that time. Special Enrollment Periods most commonly occur when a person moves to a different state or county or loses union or employer-based insurance. Special Needs Plans (SNPs) can accept enrollment/disenrollment on a monthly basis. 3. Question: When I compared drug plans online, the website said my drugs will cost more/less than what I pay today. Why? Answer: This can occur for a number of reasons. One reason is that drug plans make changes every year. 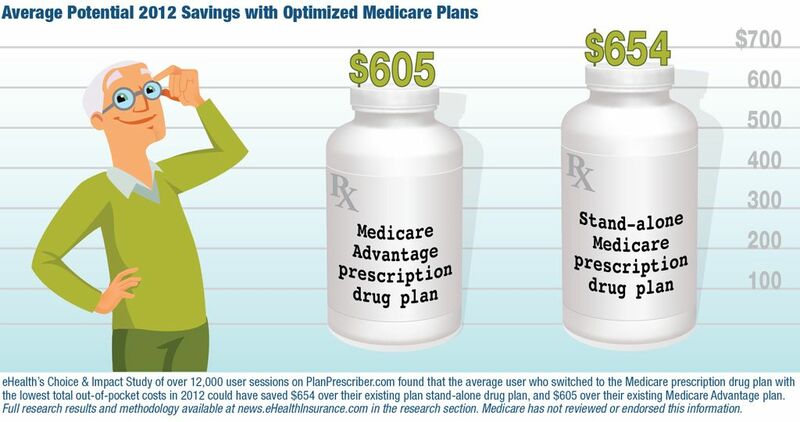 A plan's premiums may go up or down, and the drug formularies each plan covers may also change. Also, the amount of money a plan pays for each drug can change each year. Another reason prices may differ from what you actually pay is because pharmacy prices often vary. Many plans now have preferred pharmacy networks, offering you a better price if you buy your drugs from a preferred pharmacy. If you buy from a non-network pharmacy, you're likely to pay a higher price. 4. Question: Can I travel during the holidays if I haven't updated or reviewed my coverage yet? Will I have Medicare coverage on my trip? Answer: First of all, you do not have to change your coverage during this year's AEP. The coverage you have in 2012 should carry over into 2013. However, the coverage you will have on your trip will depend to a large degree on where you travel and what type of Medicare coverage you have. Outside of the US, in most cases, Medicare won't pay for health care. And, if Medicare won't cover your charges for these medical services, your supplemental coverage won't either, though some Medicare Advantage plans do offer worldwide coverage for emergency care. It's not a bad idea to investigate travel insurance if you're heading out of the country. On the other hand, if you travel to another state, a Medicare supplement plan will have you covered. If you're on Medicare Advantage and you visit another state, contact your insurance company before you leave. Let them know you're leaving the state and find out which hospitals and providers they want you to see while you're out of their network. 5. Question: What types of long-term care benefits does Medicare provide? Answer: Medicare will pay for up to 100 days in a skilled nursing facility and any medically necessary home health care. However, Medicare does not include benefits for long-term care. Things like nursing homes or assisted living facilities that provide custodial care (dressing, bathing and using the bathroom) are not covered by Medicare and coverage for these must be purchased independently. eHealth, Inc. ( NASDAQ : EHTH ) is the parent company of eHealthInsurance, America's first and largest private health insurance exchange where individuals, families and small businesses can compare health insurance products from leading insurers side by side and purchase and enroll in coverage online. eHealthInsurance offers thousands of individual, family and small business health plans underwritten by more than 180 of the nation's leading health insurance companies. eHealthInsurance is licensed to sell health insurance in all 50 states and the District of Columbia. Through the company's eHealthTechnology solution (www.eHealthTechnology.com), eHealth is also a leading provider of health insurance exchange technology. eHealthTechnology's exchange platform provides a suite of hosted e-commerce solutions that enable the marketing and distribution of health insurance related products online. eHealth, Inc. also provides powerful online and pharmacy-based tools to help seniors navigate Medicare health insurance options, choose the right plan and enroll in select plans online through its wholly-owned subsidiary, PlanPrescriber.com(www.planprescriber.com) and through its Medicare website www.eHealthMedicare.com.